In the last few months, there seems to be something peculiar happening in contemporary Australian politics: an ousted leader -Kevin Rudd - that was seen to be toxic before the last election is preferred in opinion polls over the current prime minister - Julia Gillard - and the current opposition leader - Tony Abbott. 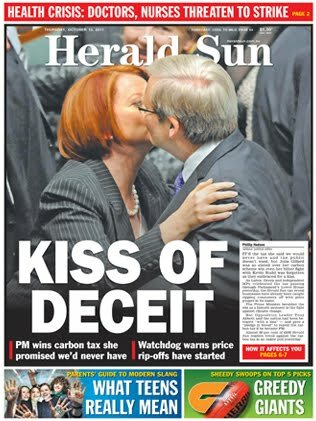 And in more recent days we have had efforts to patch an obvious chasm between the prime minister and former prime minister with what's known as the Kiss. So, here is the quick interpretation of these two events. Although it is slow and lugubrious, we are seeing the decline in the institutional organisation of the Labour Party in Australia. The details of its decline have been charted for some time, but what is emerging is a distance developing between the sources of labour's strength with, for example, unions and the way in which it organises its politics. Rising from political ashes is Kevin Rudd because his original rise was not organised directly through factions or unions, but in a peculiar bid to a personalisation of politics through perhaps a political bureaucracy of connections. Rudd's institutional power was always weak because of its different tactical positioning that led him to both oppositional leader and the prime ministership in 2007. Labour's embrace of this strategy to electoral success was always lukewarm because of its disconnect from - once again - factions and other institutional sites in the Labour Party. In contrast, one of the elements that remains a shackle around the leadership of Prime Minister Julia Gillard is that she has had to tread through this institutional territory to achieve her current status. Indeed, the career of Julia Gillard - a woman in the very masculine game of labour/union politics - has served as a form of repression of the Gillard persona, a constraint that manifests itself in her speaking style, in her penchant for repetition, and in her very careful media presence. She has negotiated the shoals of infighting in Labour and labour effectively. However, those techniques do not necessarily make it easier for her to represent herself as a distinctive leader in national politics. It is not that Kevin Rudd is likeable; it is that his organisation of power was derived from populist sources despite his bureaucratic tendencies. Appearing on network 7's Sunrise morning program for two years prior to 2007 allowed Rudd to humanise himself and to construct a distinctive persona that played in the contemporary politics slightly removed from the institutional structure of party politics. 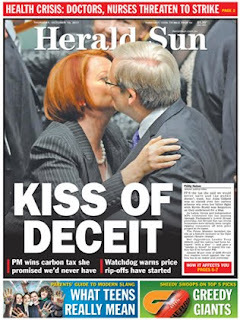 The Kiss between Gillard and Rudd is an interesting turn. It is invested - saturated really - with affect and perhaps affection. However, the interpretation is one of coldness - a disconnect because of the past animosity between the leader who ousted the past leader. All of this underlines the way that both persona and affect are at play in contemporary politics and are whittling away at the institutions of political parties. Political leadership is now a display of a public presentation of the self that can embody sentiment. Both, through the kiss, demonstrated their inability to translate politics into the personal. There was increased tension between the people but I think that there is more type of political unity going on. It was a good article on the ongoing situation.